If you had a magic flying bed, where would you go? That was the question that was put to my children by Memory Foam Warehouse this weekend. 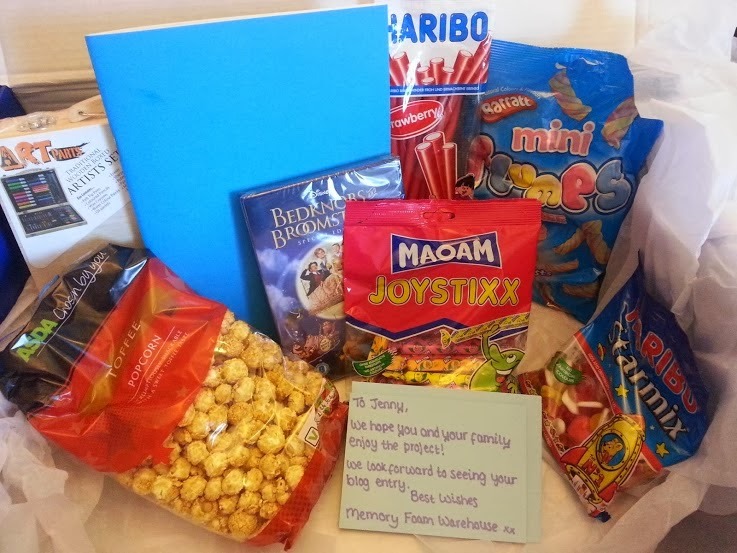 To give the children inspiration they sent us a huge parcel of snacks, a pad of paper and an art set, and a copy of the 1971 children's classic - Bedknobs And Broomsticks. 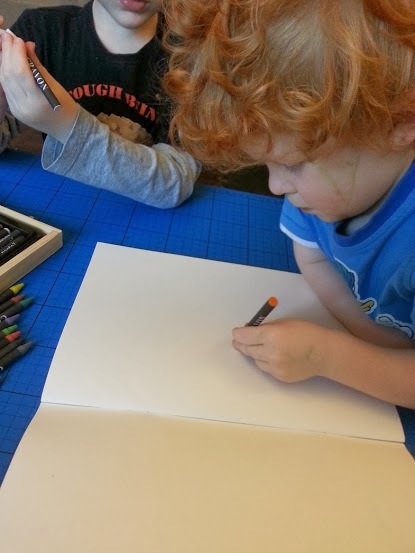 Then we got out the brand new art set and the boys drew pictures of exactly where they'd want to go if they had a magic bed that could fly..
My 5 year old took it very seriously. He decided that his magic bed would take him somewhere very real - the jungle! 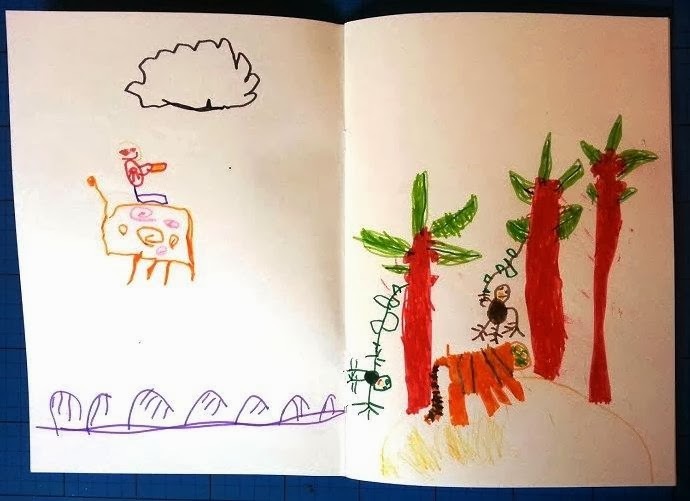 He started with a tiger and trees, then added monkeys swinging from vines. 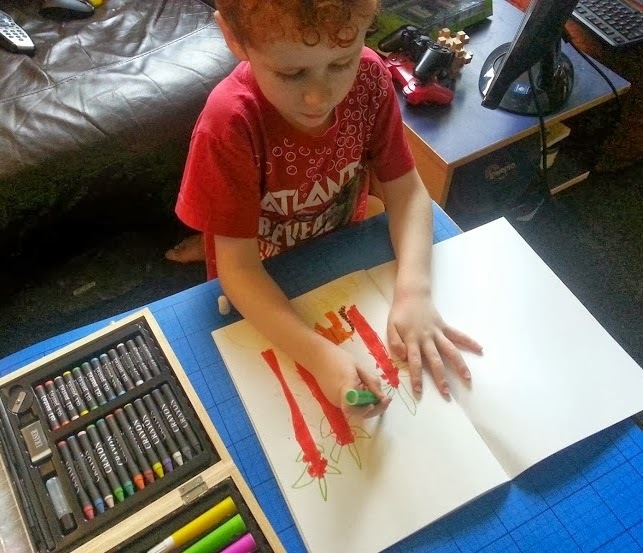 Then he drew himself on the magic bed - complete with magic bedknob and patterned duvet - I was very impressed. 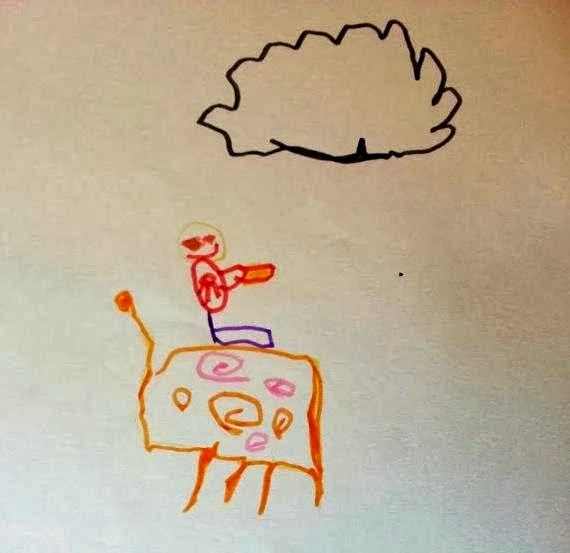 My 3 year old wanted to draw a jungle like his brother, but when he started it turned into a space scene - which is far more his usual sort of storyline, and I was pleased because it's much better to use your own imagination. 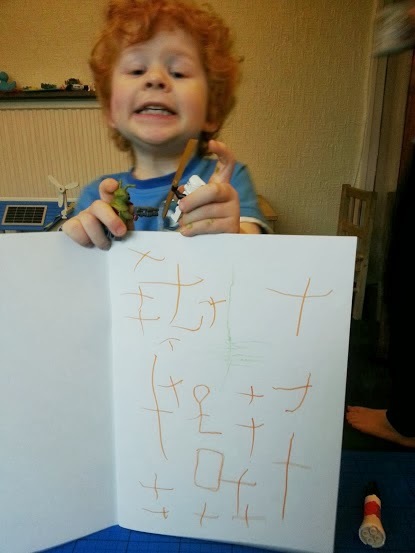 Although he managed to draw on his face, hands and neck with 3 different felt tips before I put them away, my 3 year old's picture was all in orange "because it's the best". He's sitting on his bed and floating around among the stars.....it's a lot more peaceful than I'd expect from my lively littlest one! It was really sweet to see what ideas they came up with, and I was surprised that both of them chose something far more 'normal' than the land full of talking animals that appears in the film. We had a great afternoon and the boys really enjoyed it. Where would your little ones choose to go? Great drawing boys 3 and 4. I'm really impressed by Boy 3's jungle, his drawing is so clear! Love the drawings and the idea! It's funny watching old films these days and laughing at the effects which seemed excellent when we were kids. What a fab competition! 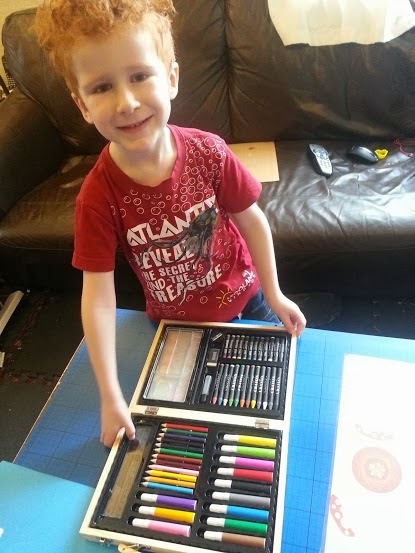 Love the little drawings, it's great to get little ones imaginations going and looks like they had a great time. 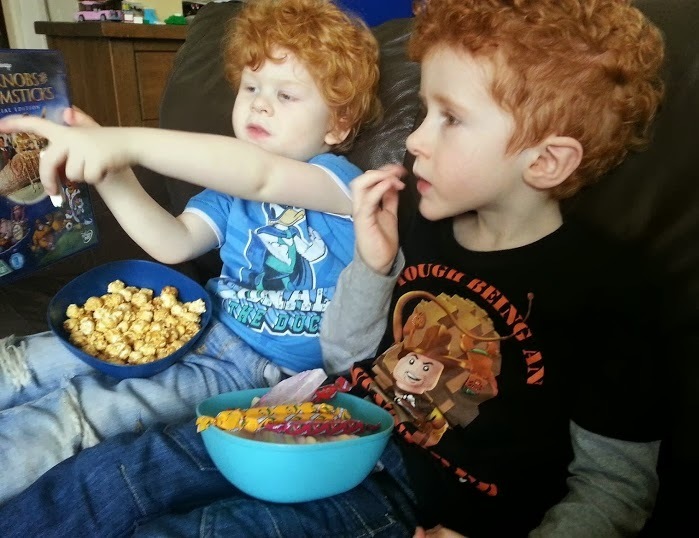 what a great idea for a themed afternoon, I love your boys pictures especially the use of orange. its our house best colour too! My children adored Bedknobs and Broomsticks - they didn't seem to notice that it is dated at all. Glad they chose achievable places to go to! Your boys are very artistic! I'd completely forgotten about that old classic Bedknobs and Broomsticks....must get it some time, as I'm sure my two would be as enthralled as yours were! Their pictures are brilliant and great that they both showed their very different personalities in the pictures!